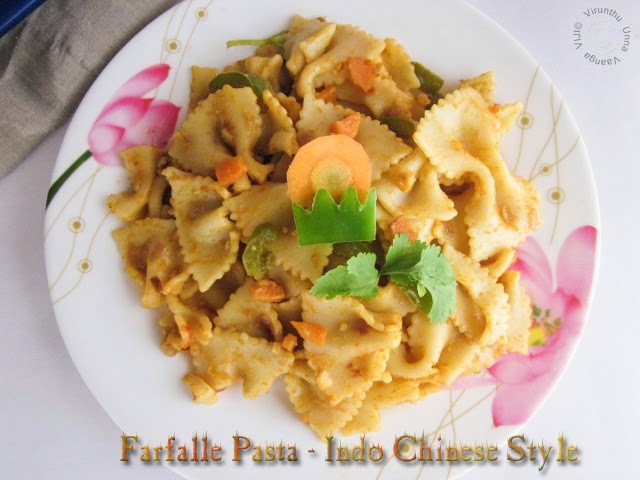 Nowadays people love healthy vegetable pasta recipes. It’s available in many shapes like spiral, shell, elbow etc. I prepared the yummy pasta with Farfalle pasta which is bow-tie shape, which is cooked and tossed with mixed vegetables, tomato puree and sauces. 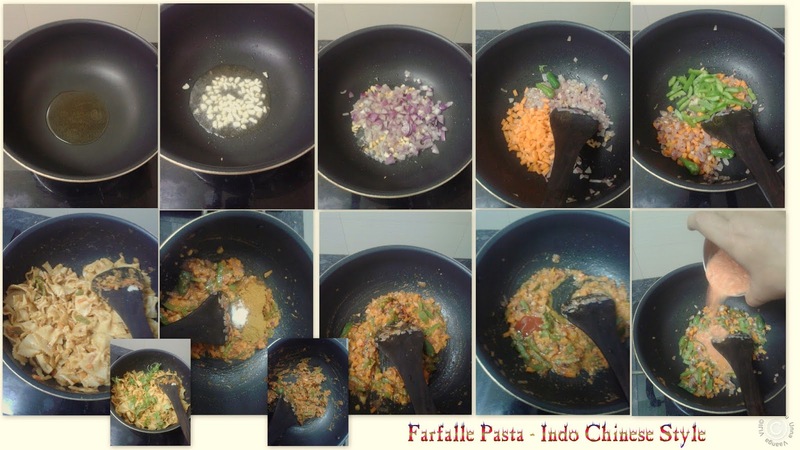 I used little peanuts while make puree of tomato to enhance the taste of the pasta recipe. It really works very well and the taste of outcome is awesome. As all of us know that pastas comes from Italian. 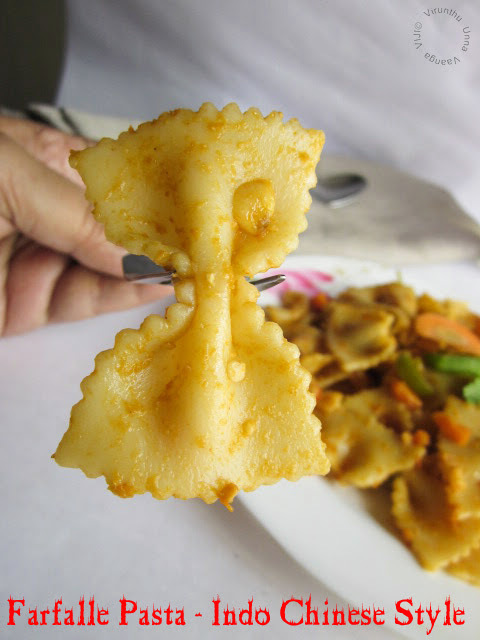 The bow-tie pasta named as Farfalle which is comes from Italy word Farfalla means butterfly. 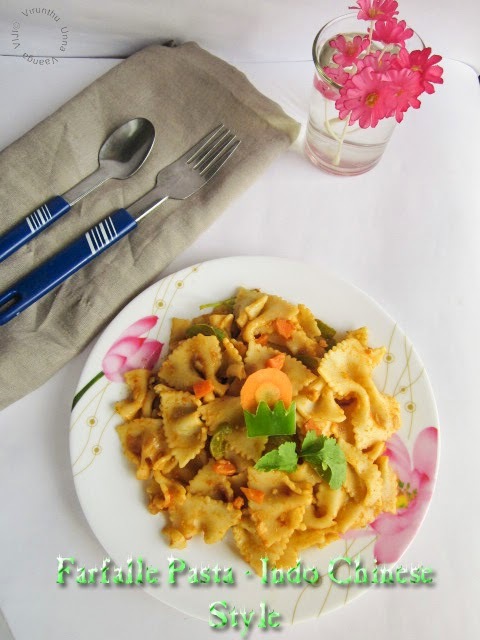 Am sure kids will love to have the yummy pasta with mild spicy and tomato flavor. Boil water with little salt and a tsp of oil, and then add pasta. Cook the pasta soft but not mushy. Drain water and wash it with cold water once and drain it again then keep it aside. Blend the tomatoes with peanuts into puree and set aside. Heat 2 tsp of oil in a pan on medium flame, add chopped garlic stir it for 30 seconds, add onions and stir it till turns translucent. Add green chillies and carrots sauté it for 2 minutes, following by add green bell pepper and cover the pan with lid and allow cooking for 2-3 minutes. Then add red chilli sauce and soy sauce stir it once, add red chilli powder, coriander powder and salt allow cooking till the raw smell goes. Now the mixture is in semi-gravy consistency, add little water to it and allow cooking for 1 minute on low flame level. 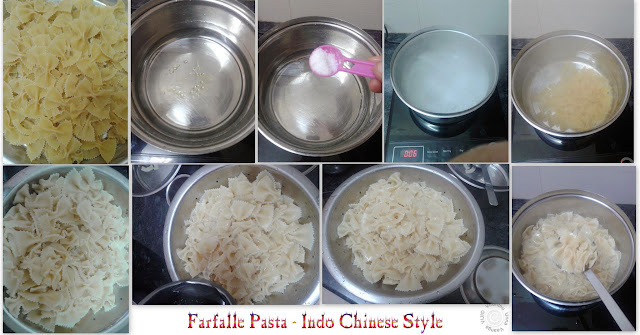 Add the cooked farfalle pasta and toss it well till pasta coats well. Spread coriander leaves and switch off the flame. Garnish with carrot or capsicum and serve it hot. You can replace with any other shape of pasta varieties. 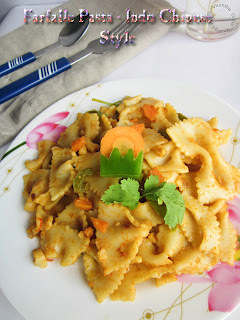 Adding of peanut is optional, but it gives unique taste to the pasta. 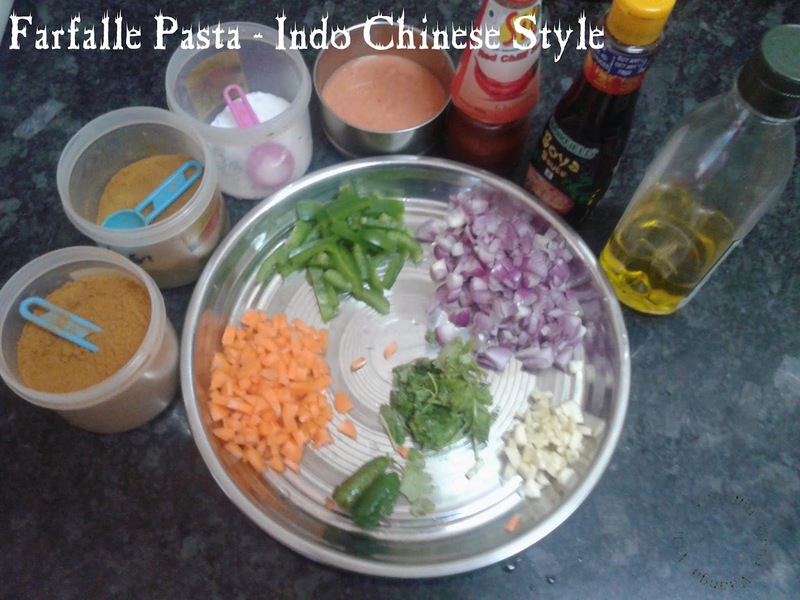 Add tri color capsicum to get colorful recipe. 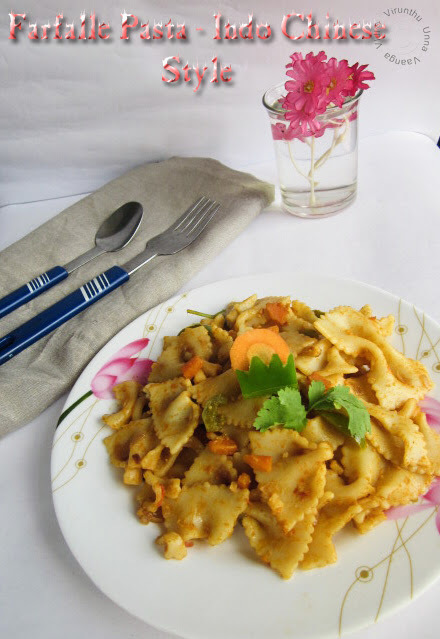 You can toss the pasta with pasta sauce which I posted already and its my favorite too. 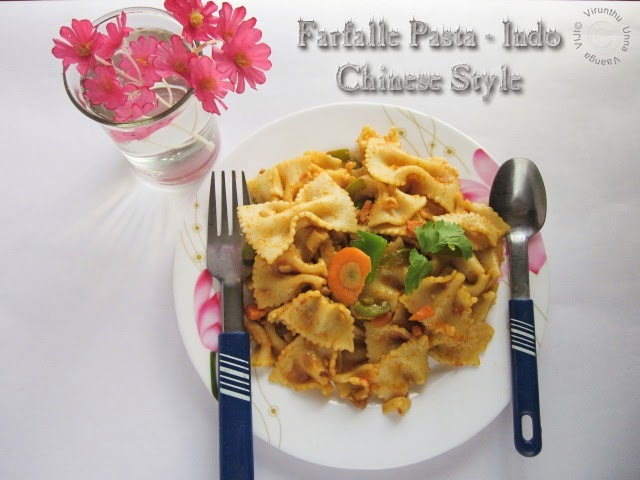 Enjoy the healthy and delicious Farfalle Pasta!!! such a lovely pasta .I call it bow -tie pasta .Looks delicious. 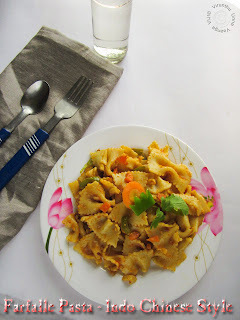 Nice recipe..pasta sounds yummy n flavorful!